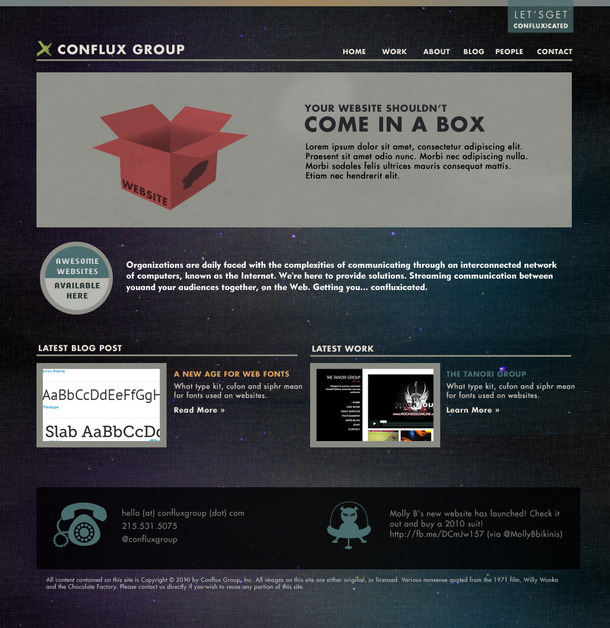 Conflux Group, Inc. is a Philadelphia-based web development and consulting firm, focused on providing affordable website and web application development services to small and medium business and nonprofit clients. We believe that any organization can benefit from a well-planned and strongly executed Internet presence. It's important to have sites and tools tailored to your audience with clear actions for your viewers, whether sales, donations or product and service awareness. It’s all about building connections between your organization and those you want to reach. We value customized solutions. While other firms provide turnkey out-of-the-box websites, we focus on customizing solutions to the individual needs of the client organization. No two organizations are the same, and because of that, a rigid turnkey solution often leads to compromises in requirements when using prepackaged tools. We’re passionate about the Internet. In just a short time, the web has transformed the way the world thinks about information, and we’re excited to help any organization reach its full potential with our industry experience, expertise, high-quality design and strong technical foundations. Web development is what we do for work, but it’s also what we do for fun. We love to build awesome websites and applications. We create convergence. Screenshot of our current homepage.